Blog Why Use a Wok With a Round Bottom? I thought I knew everything about woks since I have been using a flat-bottomed wok for years until my fiance came home with a round-bottomed wok. It appeared that she knew more about woks than I did so I decided to do some research to find out what was so great about round-bottomed woks. Through my research, I came up with the following information as to why use a round-bottomed wok. The heat distribution in a round-bottomed wok is more linear than a flat-bottomed wok. This direct heating from the very bottom of the wok to the top edge makes it much easier to toss and stir-fry your ingredients. Round-bottomed woks are of course are round. Round-bottomed woks are impossible to warp because of the distribution of the iron and carbon molecules in the rounded surface. The heat is evenly distributed up the sides of the wok in a linear fashion. Flat-bottomed woks, on the other hand, can have hot spots in the bottom of the wok because of the flat shape. Because this shape is flat, it is susceptible to warping in high heat conditions. Wok utensils are designed mostly for round woks. The edges of wok ladles and spatulas conform to the surfaces of round-bottomed woks. Wok spatulas have a curved leading edge. This curved leading edge does not conform well to the bottom surface of a flat-bottomed wok. The bottom line is that the shape of utensils is usually not a big deal and should not sway you in your purchase of either a round or flat-bottomed wok. Woks have been used for some 3,000 years in China for a variety of cooking methods, including stir-frying, boiling, and stewing. Most all of the original woks had round bottoms and were hand hammered. 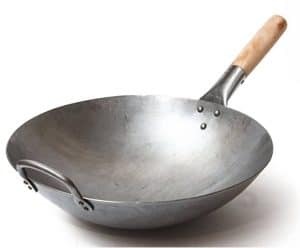 Today, most commercial restaurants that use woks use round-bottomed woks. These restaurants usually have special stoves that generate a great deal of high heat. Carbon steel woks are the choice of professional chef’s. The first wok used was a round-bottomed cooking vessel, originating from China. The use of the wok is very prevalent in South China, particularly Guangdong Province region. The wok is the most common cooking utensils in China and also found in many parts of Asia as well as becoming favorite cookware throughout the world. Woks use a range of different Chinese cooking techniques, including stir-frying, steaming, pan frying, deep frying, poaching, boiling, braising, searing, stewing, making soup, smoking and roasting nuts. Spatulas or long-handled utensils such as wok ladles are used when cooking with woks. Since woks get very hot in the traditional method of cooking, the extended handles of these woks allow cooks to work with the food without getting burned. 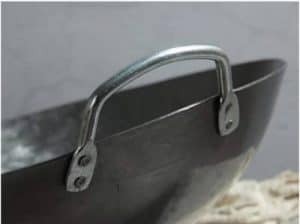 If you are considering purchasing a hand-hammered wok, make sure that the rivets that attach the helper handle These rivets should be riveted like this POW wok below. A round bottom wok enables the traditional round spatula or ladle to pick all the food up at the bottom of the wok and toss it around quickly. The conventional spatula conforms to the sides of the wok. With a gas hob or a traditional pit stove, the bottom of a round wok can get hotter than a flat wok and therefore is better for stir-frying. Golly, you have hybrid cars, and now you have a hybrid wok. This wok is cast iron and is unusual because it has a flat surface to contact the stove but a curved inner surface. With this, you have the best of both worlds. You can use this wok on a grill, gas stove, electric glass or porcelain stove or an electric coiled stove. If you are considering a flat-bottomed cast-iron wok, I recommend the pre-seasoned cast-iron wok by Lodge. These woks are very heavy. The weight is about 11.6 pounds, and they work well on all kinds of cooking surfaces such as gas stoves, electric coil stoves, porcelain or electric glass-topped stoves, etc. These woks hold their heat well and are reasonably priced. These cast iron woks have a flat bottom that contacts the range or cooking surface, but the inside of the wok is round. This inside round portion of the wok is an excellent attribute for stir-frying. Check the availability at Amazon. Do not drop them on the floor. Cast iron woks can break if you drop them on the floor. They are more brittle than carbon steel. They are heavy (11.6 pounds). The helper handles can get very hot. Be careful. This wok takes longer to heat than carbon steel. It also takes longer for this cast iron wok to cool down. You should not use metal utensils in this pre-seasoned wok. For best results, cook using medium heat and apply a small amount of vegetable oil to the cookware’s cooking surface before each use. You need to use heat-resistant silicone, plastic, or wooden utensils only. Avoid metal utensils. With carbon steel, you can use any utensils, even metal ones! After cooking, clean the cookware using a stiff brush and hot water, then rinse and towel dry. To remove stuck-on food, boil water in the cookware for a few minutes to loosen residue, then rinse and towel dry. Do not put cold water into the hot cookware or let it air dry. Do NOT buy a stainless steel wok. The food will always stick. For heaven’s sake, never buy an anodized aluminum wok either. EVERYTHING sticks to those, especially eggs, which are used in Chinese fried rice. These are excellent tips whether you purchase a flat-bottomed wok or round-bottomed wok. Do not buy woks that are pre-seasoned or so-called non-stick. The non-stick surface can burn off with the high heat over a length of time. This can be unhealthy and very costly. Do you want to buy a new wok every time the surface wears away or risk unhealthy cooking? I am not sure about the non-stick surface of the cast-iron wok made by Lodge that I mentioned above. Amazon’s brand of cast iron woks recommends that you should not use metal utensils on the surfaces of their wok. Here is another point I found during my research. Using either a flat-bottomed or round-bottomed wok on an electric range or stove does not get hot enough. You would be better off using a carbon steel pan or skillet for stir-frying. If you are serious about stir-frying with a wok, I recommend you investigate wok burners. Check Amazon for availability. These burners are made for woks, and they get very hot! To the right is the PowerFlamer Outdoor Long Leg High-Pressure Propane Manual Ignition Wok Burner. This burner will generate more than enough heat to use you round-bottomed wok. It is excellent for picnics or large gatherings. It is not intended to use indoors. Some say that you can use a wok ring with your wok. The problem with a wok ring is that it keeps the wok away from the heat source. If you are trying to get the heat on the wok as high as possible, then the wok ring will be working against you. Electric woks may be convenient but are inefficient heating woks. They not ideal for Chinese dishes. If these woks are Teflon-coated, the coating can come off with the heat and the fumes are very toxic – taboo for Asian cooking! Just stay away, far away, from anything with Teflon. A lot of manufacturers have avoided Teflon coating their woks in the manufacturing process because of the toxic properties of Teflon at high temperatures. The other problem is that they are using other forms of coatings and only time will tell if these will become toxic. Just stay away from anything that is not carbon steel or cast iron, and you should be ok.
Why Use a Flat-Bottomed Wok? Flat-bottomed woks are best used on electric stoves, induction stoves and gas stoves. What is one advantage of a flat-bottomed wok? Flat-bottomed woks work great on induction stoves if they are made of carbon steel.